I’ve seen it a million times but that doesn’t make it right: unplugging the USB stick or other USB gadget from the computer without safely removing it from the system. You can damage the data from the storage of that device (if it has any and most do) and you even risk to damage the device itself. Most of the people who do that don’t know that this can be harmful and don’t know how to do it although it’s a simple thing that should become a reflex before physically unplugging the cable. 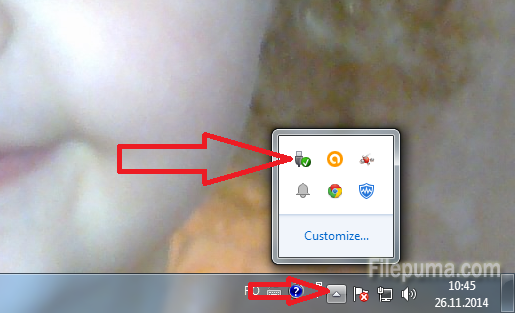 Step 1: Click on the little arrow on the right of the task bar to show the hidden icons, then click on the icon that looks like a USB connector with a green check mark on it. Step 2: There will be a small pop up window. 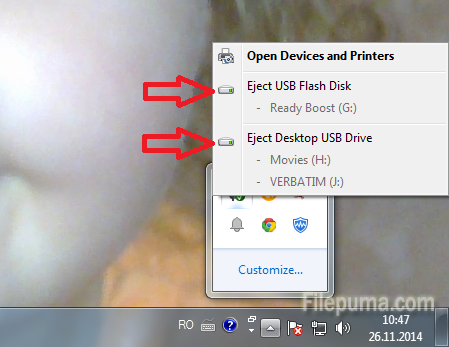 Click on the drive that you want to eject. Step 3: Wait until a dialogue box saying it’s “Safe to Remove Hardware”, then unplug the USB cable or device from the computer.